Q: Why don't we start with your earliest memories of going to the movies? Kitty Carlisle Hart: Well, the first time... I was born in New Orleans, and I wasn't allowed to go to the movies. It was considered oh, not proper for children to go to the movies. I was taken to concerts when I was six, seven years old, and sat in a box throughout the whole evening. When my mother's friend said, how can you take that child and keep her up till all hours, but mother thought that was good for me. Whereas the movies wasn't good for me. But one day, our cook went mad, and tried to kill us all, and we had the police in the house, and it was a really, very traumatic experience, and my mother thought, in order to take my mind off the terrible experience that I'd been through -- I was then about 8 -- she decided to take me to the movies. And we went downtown, to a place, I suppose it was called a Nickelodeon. It was a store front. And all the seats were just on the level. And they, maybe it held 30, 40 people. And we got there late, and so we sat in the very back. And the reason I tell you this is because it changed my life. This whole experience changed my life. Because everyone was laughing at the Chaplin antics, except me, and they discovered that I couldn't see that far away. I was near sighted. I was born myopic, and I got glasses, right after that. After the Chaplin movie. I don't know what movie it was, of course, because I never saw it. But at least I got my glasses! I didn't enjoy making movies. 'Cause I never thought I was really very good at it. And I wasn't crazy about Hollywood in those days. I wasn't allowed to go out with anybody. My mother thought Hollywood was a den of iniquity, and people came to terrible bad ends there. So I was chaperoned everywhere. Which meant that I didn't get invited many times, 'cause I had to bring my mother. Q: Then World War II came along. I wonder if you have any observations about how movie going changed at that time? 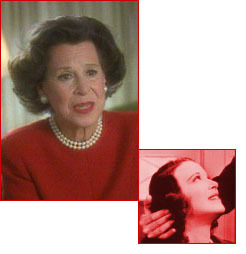 Kitty Carlisle Hart: There were a lot of movies about the war. And that was very important to people who had someone overseas. It was the last war we had where everybody felt the same. Everybody cared. Everybody was on the same side, here. And so, everyone cared about those war movies. And they were very well done. Very well done. Q: What has been more important to you, movies or television? Kitty Carlisle Hart: Yes, well I think I answer the question by saying that I was enormously flattered that anybody wanted me in the movies. It never occurred to me that I looked like a movie star. And I didn't, that's why my career was very short lived. But I think television had more of a, of a, of an influence on my life, than the movies, because with television you came into somebody's home.... And the show that we did, which was "To Tell the Truth," was a family show. And so many people have said to me, the show was so wonderful for us because we watched it as a family. My parents loved it. And we loved it. And that has made every town in America into a small town for me, because I see only smiling faces coming toward me. People remember me, from television. They don't even remember me from "A Night at the Opera." They have no idea that I played the lead and did all the singing. People don't even remember that. But they do remember television, particularly that show. Note: Red text is available in RealAudio.